One of coldest tarns so far today! 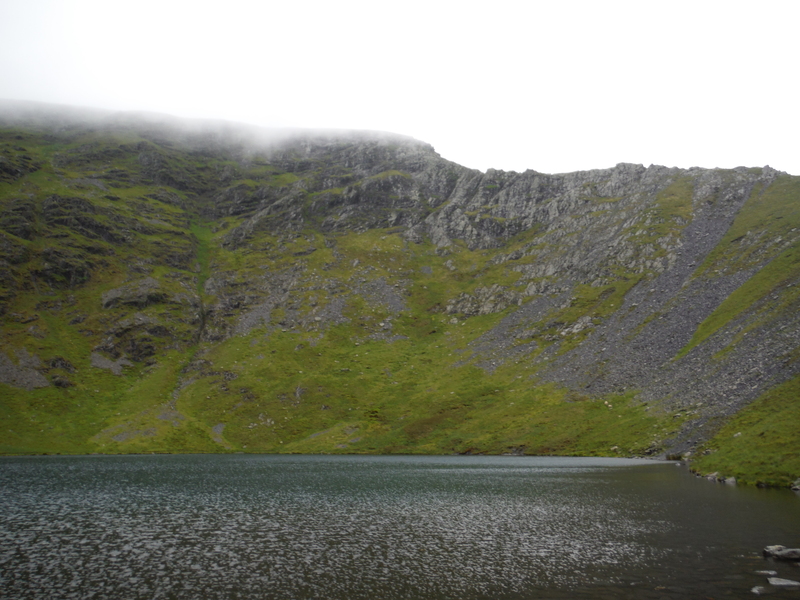 I parked at Scales and walked up to Scales Tarn, just under sharp edge on the side of Blencathra. 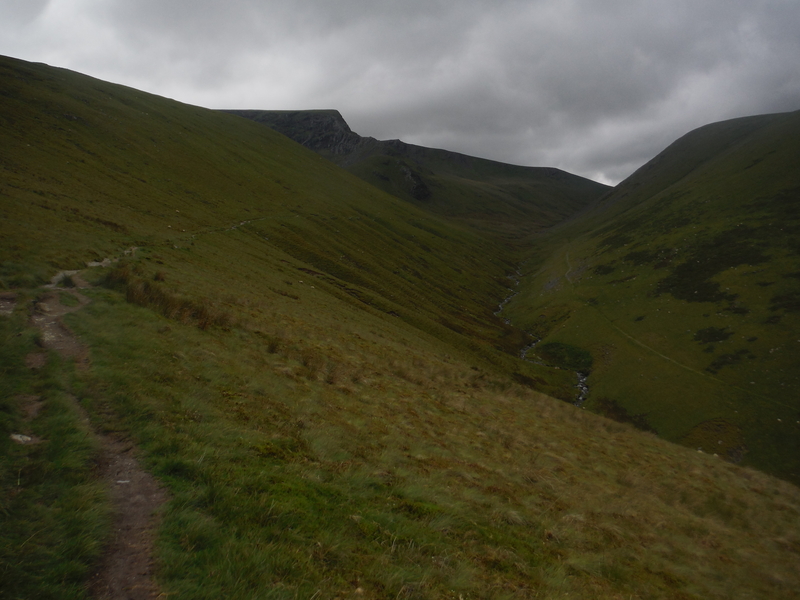 There were some good views on the way up, but the wind was picking up as I went which was not nice! There were some very ominous looking clouds hanging moodily in the sky, but I ploughed on to the tarn. Scales Tarn sits in a hollow on the side of the mountain, right below the ridge so I hoped the wind would be less strong there. But once I’d got changed and walked round to the far side it was as strong as ever. 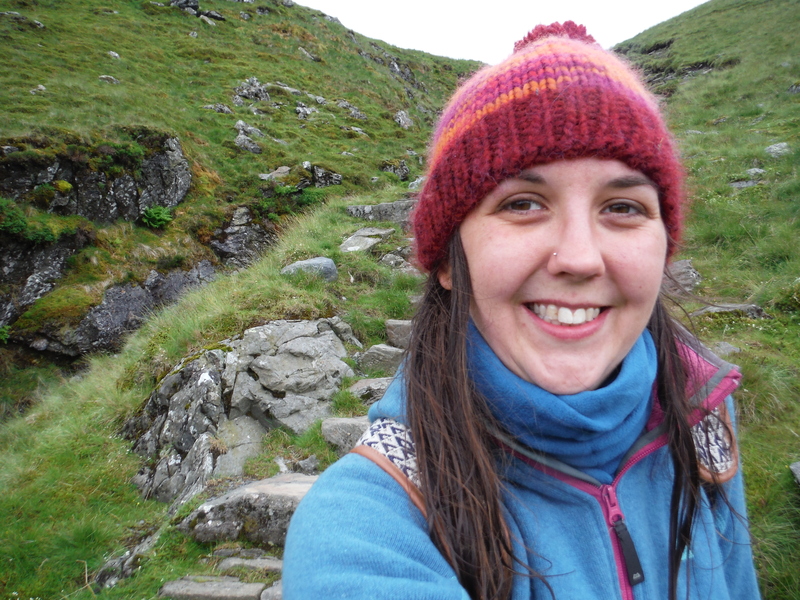 As I walked around the edge I paddled through a little stream carrying the water away from the tarn and even that made my feet hurt with the cold. Getting into the water took a long time and it was very, very cold. I was just in my bikini, a decision I was starting to seriously regret! At first my feet and legs were painful with the cold and by the time I was up to my knees I was starting to wonder whether I should just turn back and not swim today. 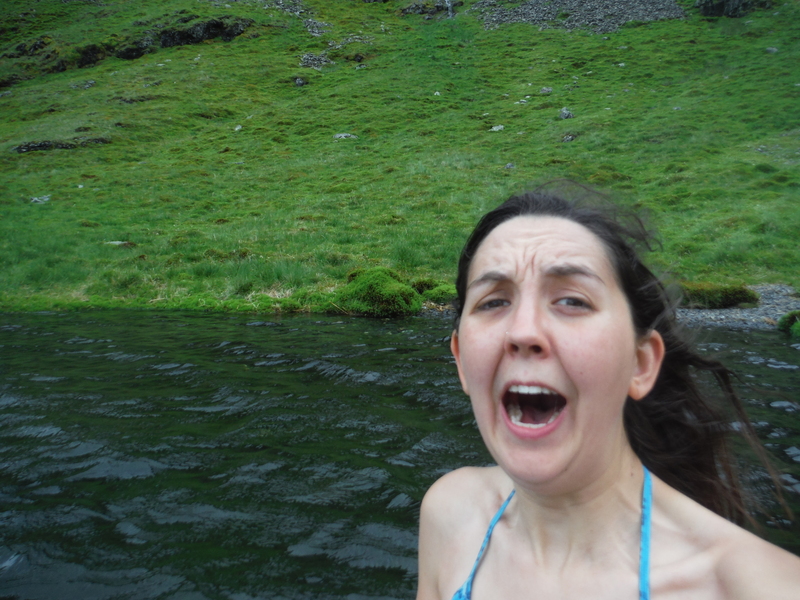 I was even starting to plan out a blog post all about how I went all the way up to the tarn and didn’t swim. But I’d gone all that way. I’d slogged up the hill. I was standing there, in my bikini, up to my knees in freezing cold water on the side of a mountain and it just seemed stupid to turn back. So I went on, slowly getting deeper and deeper into the water and hoping my body would acclimatise. And it did. I’m not saying that it felt lovely and warm, but after a few minutes I did feel able to deal with the cold and eventually I just went for it and started swimming. The wind was blowing straight into my face and whipping up little waves which splashed copious spray into my face as I swam and made progress difficult. About half way across it died down but only for a moment and then started coming in from the side which was slightly better as it meant the waves weren’t splashing into my face any more. 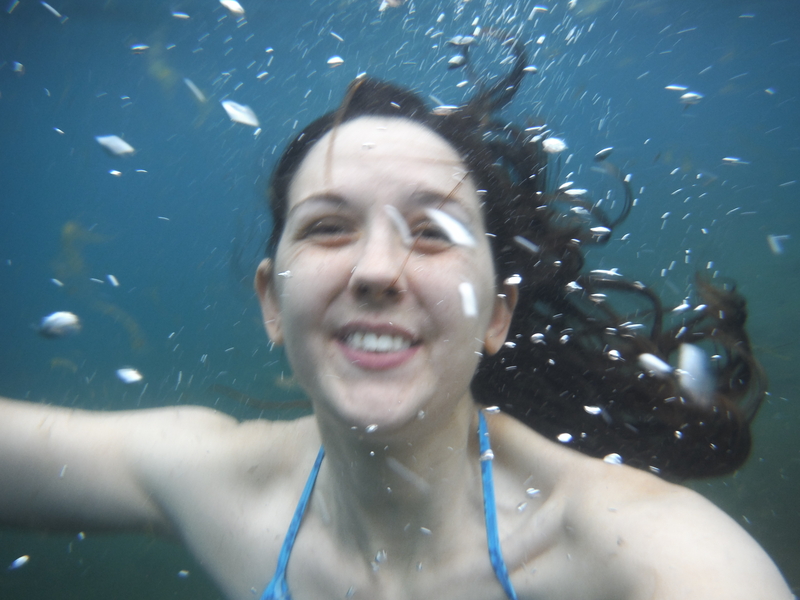 I was worried that when I ducked under to take my underwater selfie it would be painfully cold, but it wasn’t actually too bad, I think my body had got used to the temperature by then. Getting out was hard work, the tarn was shallow at the edge and I had to walk over the slippery stones with my numb feet with the wind blowing on my bare, wet skin. I actually felt colder when I got out than when I was in. Getting dressed again was hard work, but by the time I set off back down the hill the now familiar feeling of elation was starting to set in. The walk back was windy and cold and if I hadn’t swum I think I would’ve been annoyed and grumpy and just slogging my way back to the car. But swimming always makes me feel so good – I was cold, but invigorated, proud of myself and full of energy. Anyone who knows me knows that I’m no runner, but I hurried down the path in an ungainly, unco-ordinated semi-jog that involved a lot of kicking myself on my own ankles and not-quite-falling-over at every uneven part of the path. It felt great.